WEARING: Club Monaco Top, H&M Leather Jacket, 7 For All Mankind Jeans, Calvin Klein Bag and Aldo Shoes. So much has been going on, I swear that I have been working excessively hard. Between my job, designing a new collection, doing a marketing proposal and blogging I am left with no time to sleep (what is that again). I am not complaining, I am super stoked to be involved in everything that I am; I feel extremely lucky to have been invited to be part of these projects. A lot of cool stuff is being done and created in the studio. The designing part is finished, I have the collection on paper, now I'm making those sketches into patterns. I feel completely ready for what 2014 is bringing (and will bring), I hope I can fulfill every aspiration or at least lay a solid foundation for my work and creativity's growth. On a style note, I recently purchased my first pair of 7 for All Mankind Jeans; I can't believe that I have never owned any before. They fit me like a glove and are made in the USA (props to the company). I am already saving up for another pair because I can see these jeans becoming one of my staples. 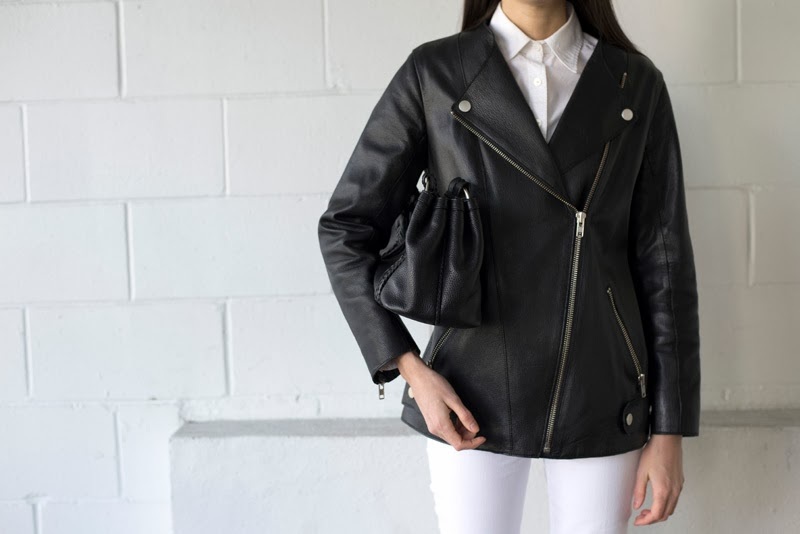 Black, white, leather and jeans; perfect way to to start the week. So happy to hear you're working hard and mighty for your dreams ^_^ Can't wait to see the collection! I can't believe this jacket is from H&M, it looks way too cool. perfect outfit as usual. the shape of the jacket is great. really loving your minimalist style! you look gorgeous. I'm adore you blog. im glad you came across my blog and leave comment, just for the 1st time saw your blog and i'm in love. yes super agree simplicity is always have something more. They do fit like a glove, you look hot, babe! And that jacket... Pure sartorial poetry. the perfect jacket! so rock! This is beyond PERFECT! every single item individually is stunning, but also love how you styled them together. followed, and looking forward to your updates. rebellion yet classic ! love your choices from head to toe ! good luck with the super tight schedule ! your jacket is absolutely perfect! Love white jeans and one day I will save some money to buy a jeans from this brand!!! So busy but happy I know this feeling!!! is an honour to see you there ! !